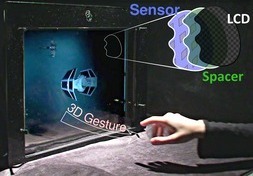 A thin, depth-sensing LCD for 3D interaction using light fields which supports both 2D multi-touch and unencumbered 3D gestures. 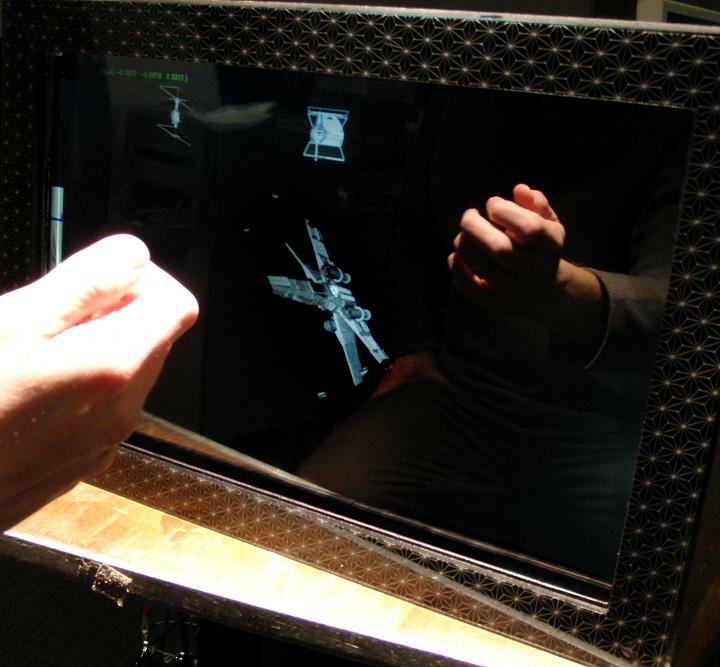 The BiDi Screen is an example of a new type of I/O device that possesses the ability to both capture images and display them. 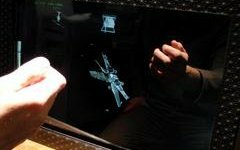 This thin, bidirectional screen extends the latest trend in LCD devices, which has seen the incorporation of photo-diodes into every display pixel. 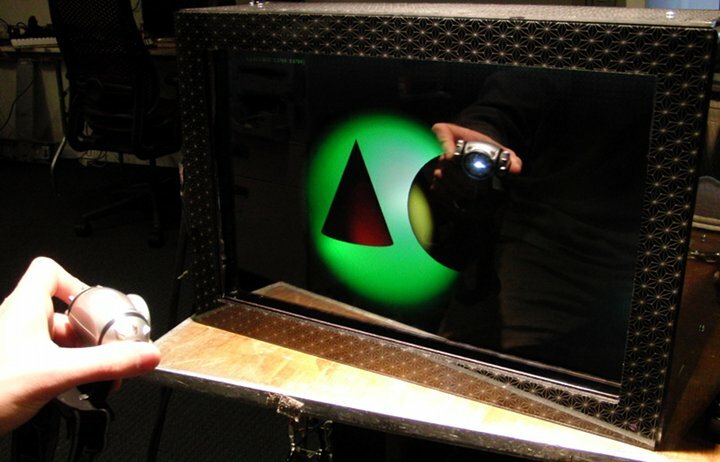 Using a novel optical masking technique developed at the Media Lab, the BiDi Screen can capture lightfield-like quantities, unlocking a wide array of applications from 3-D gesture interaction with CE devices, to seamless video communication. 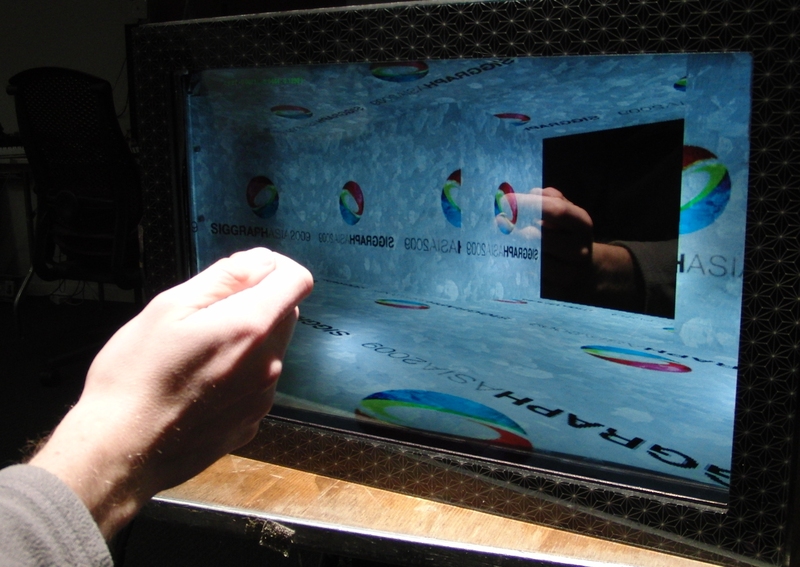 The following are images of the BiDi screen prototype built for the SIGGRAPH Asia 2009 Emerging Technology exhibition. Case design by MIT UROP Emily Tow. The re-lighting demo, shown running on our new prototype. The world-navigation demo, running on our new prototype. 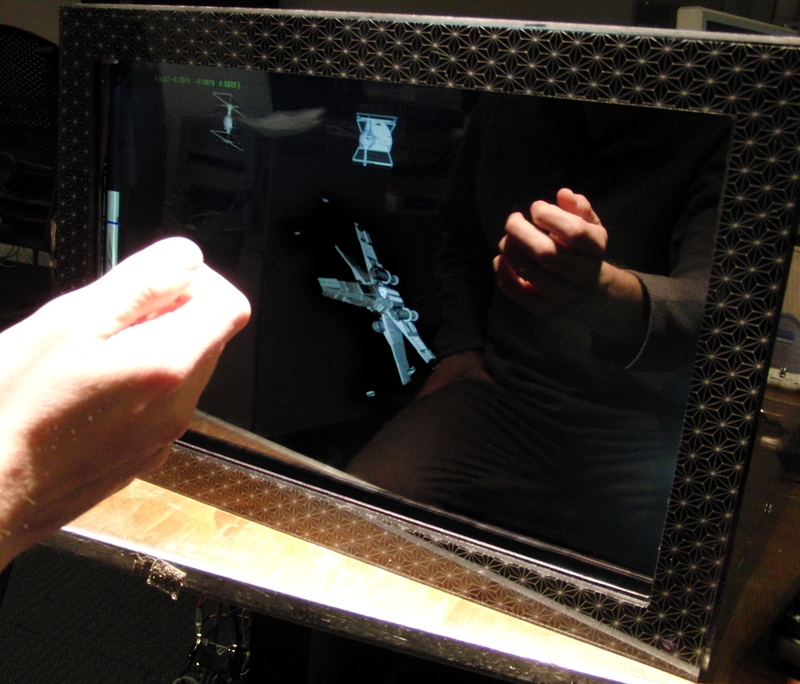 The model-manipulation demo, running on our new prototype. Check here for more videos. Q: What is BiDi screen? Q: How does it work? 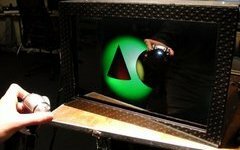 How does it sense 3D information from a thin display? 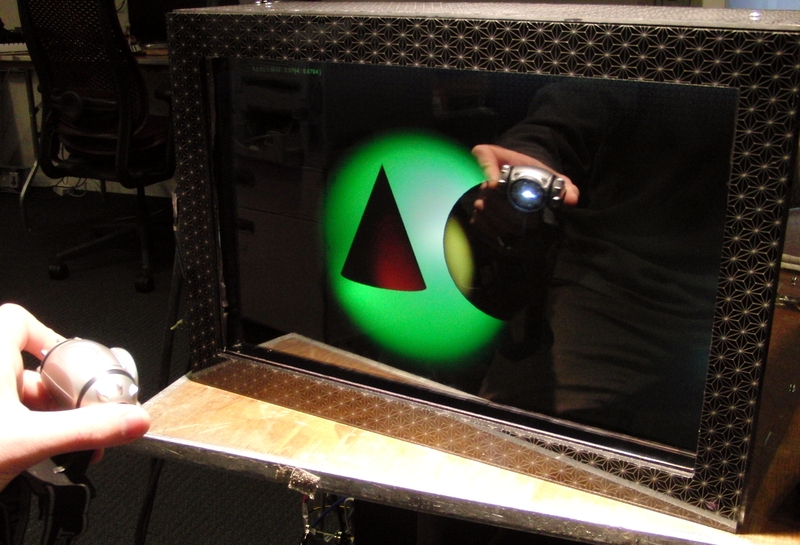 Q: How is this different from Surface, SecondLight, Gesturetek, Perceptive Pixels and xyz? Q: Will this replace webcams? Q: Will this replace flat-bed scanners? Q: What are some other applications of this technology? Q: What are the future directions? Q: Isn’t this the same as something Apple did? 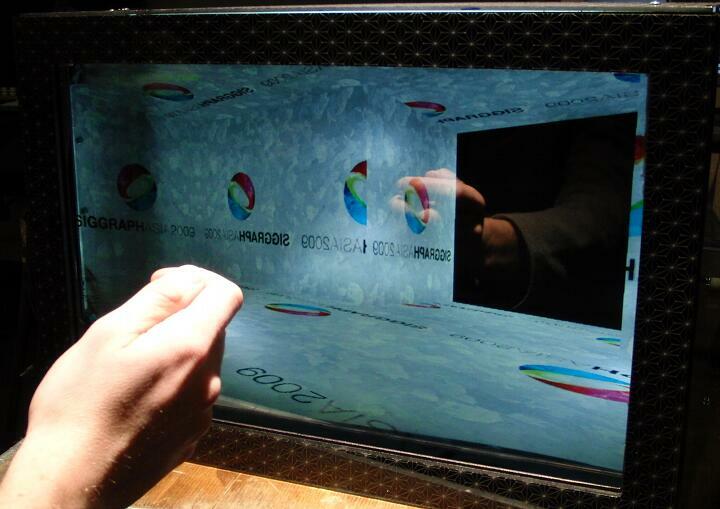 Q: How did you implement the light-sensing layer of the BiDi Screen? Q: Isn’t this same as some other projects that use cameras in the back? Q: What are the parameters of the current prototype? Q: What components did you use for the prototype? Q: Why isn’t the BiDi Screen prototype as thin as the LCD panel it uses? Q: How does the tiled-MURA mask used in the BiDi screen produce equivalent imagery to a pinhole array? Q: How does the BiDi screen estimate depth? Q: Is flicker noticeable in the BiDi screen prototype? Q: Is there noticeable lag between movement and display update? Q: What type of tie fighter is featured in the videos? Q: Does the BiDi Screen herald a dystopic Orwellian future, in which sinister government bureaucrats monitor our every move, and personal privacy is a distant memory? You can find more details about the construction and operation of the BiDi Screen in our supplementary materials section. Please visit the Information Ecology and Camera Culture group pages for more projects.